Joining Bird Grove on this year’s list of entries to SAVE’s database is the Brontë cinema in Howarth (sic), West Yorkshire. The ballet, faithful to Charlotte Brontë’s novel, tells the story of Jane, from her difficult youth as an orphan, to her emotional awakening and her passionate love story with Mr Rochester. Shown from Jane’s point of view, the piece has a very intimate atmosphere throughout, with only around twenty dancers of the 46-strong company involved in this small-scale – yet compelling – production. Other highlights of the tour will include visits to the Cliffs of Moher, Rock of Cashel, Powerscourt Gardens in Ireland, Haworth Parsonage (home of the Brontë family), Stoke-on-Trent in England, Hadrian’s Wall and Edinburgh Castle in Scotland. What other writers or books have influenced you? Growing up, I would read everything and anything that my hands and eyes fell upon. The authors influential in the formation of my literary thought can be segmented over two periods: adolescence and mature adulthood. Particularly, Dickens, Brontë, Eyre, Chesterton, Pearl S. Buck and Steinbeck in the early formative years. And then, Virginia Woolf, Eliot, Waugh, Faulkner, Orwell, Dostoevsky, and my favourite Canadian storyteller, Alice Munro, among others, in my mature adulthood. We’re often led to believe that the reading and viewing habits of modern teenagers extend only as far as scanning through Snapchat messages and watching videos of kittens falling off furniture. One of the most reassuring things I discovered was that this isn’t the case. Pride and Prejudice, the Brontës, Philip Pullman, James Herriot and the poetry of Dylan Thomas all came up as favourites among the teens I spoke to. A Brontë quote on the RTL (France) horoscope for today; a student reading Wuthering Heights in The Telegraph (India). 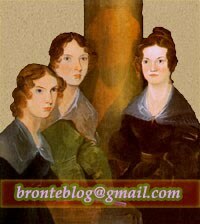 Harry Hartley posts several pictures of the Brontë Parsonage on his Facebook wall.